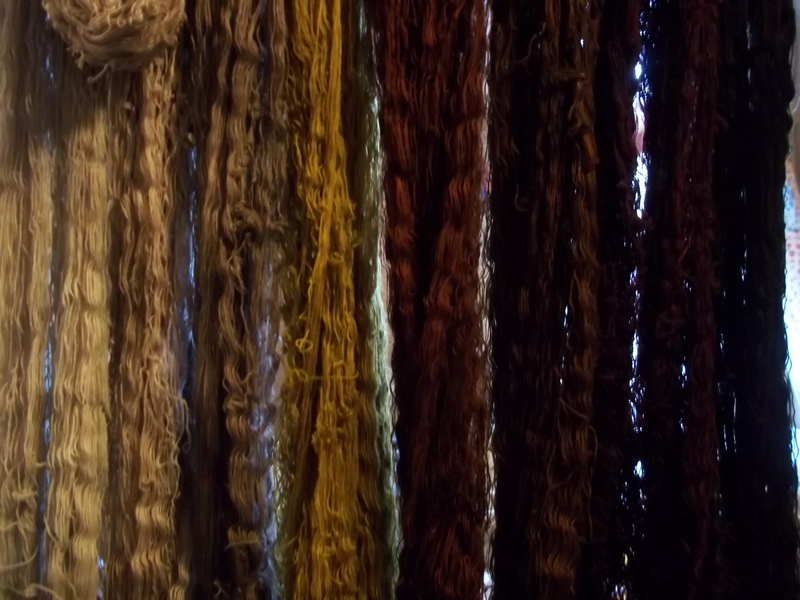 I’ve been using sheep fleece for my dyeing experiments as it is much cheaper and I knew there would be more failures than successes (how true that was!). So I’ve been a tad worried how my mixes would translate into the actual yarn and although they’ve come out darker and stronger, I’m really pleased. The gold needs to be toned down – I wrote the formula down wrong so I was winging it a bit. When I was doing all that experimenting, there were times I thought I’d never find my colours so I’m really chuffed to see these hanks all in a row. As I run into difficulty down the line, I just need to remember I got through this stage; as long as I persevere, it might just work out. These colours are for the eye area which I’m doing as a test piece for my tapestry weaving project. What you don’t want in tapestry is areas of single, flat, dead colour. If you blend yarns on the bobbin, when it is viewed from a distance the brain will see new colours. You just have to look at the variations used in the seemingly simple and utterly stunning Wallace Tapestry to realise the subtle shading and colour changes that can be achieved. You can also help yourself in the dyeing process. Normally you want the dye to be taken up evenly, but by encouraging an uneven take up you can automatically build in a bit of interest and variation. So I was careful not to soak the fibres prior to dyeing, I made sure there was too much yarn in the dyebath and I also did not stir it. It all felt a bit naughty but I am very pleased with the results! I love that there is this process before the weaving can even begin; not only are you making your own colours that are individual to you, it really makes you think about what you are about to do and why; it helps you bond (if that is the right word) with the project ahead. Joan Baxter equates it with the medieval artists grinding their own paints in this great video. There are a couple more on Why Tapestry, and The Future of Tapestry – well worth a look.